IT really has been a case of physician heal thyself for Holby doctor Arthur Digby. The troubled medic has just returned to the wards after his anxiety anguish. He’s been away trying to deal with his General Anxiety Disorder, GAD. And Rob Ostlere, who plays the medic in the BBC’s long running drama, says he can see how real-life doctors could flounder in the pressure cooker world of today’s NHS. “We hear so much in the news these days about junior doctors and the demands they face,” Rob told The Sunday Post in a break from the hectic filming schedule at the London studios. And Rob, 31, says he was really taken by the feedback from fans of the show, some who had been affected and others who knew someone stricken. “I’ve had some amazing comments from viewers who’ve said that it was good to see it highlighted in a big show like Holby. “A lot of people are affected to some degree and it’s important that it’s been addressed. And also that it’s been done right and that he got a lot of understanding from those about him. “I know people that have suffered from anxiety disorders. And despite trying to control it, that’s not always possible. “There are triggers and you have to try to learn what they are. But sometimes it can just come on in any situation. “Sometimes it’s a full-blown panic attack which is quite a big thing. And at other times it’s more subtle and not always that obvious as the person struggles to control it from the inside. The troubled doc was popping pills to try to deal with his condition, but following a few weeks off screen he’s just returned. That return from a seaside break saw him sporting a new look and Rob admits that took some getting used to. “Dom, who’s played by David Ames, decides to make him over a bit and ditch the geek look,” says Rob. “The idea is that he’ll get over his anxiety by seeming more confident and putting on a bit of a show. “It’s such a different look that I found playing it a bit odd. You get so used to getting in character by slipping on the glasses and those clothes. “So being the same person but in these stylish clothes was a bit weird. “Arthur’s in a bit of a confused state at the moment and I found that a bit with the new look, too. With the packed shooting schedule of a major BBC drama, Rob admits that the bit of downtime during Arthur’s brief time away was welcome. But you won’t find him complaining about an actor’s lot. “Look, this show has changed my life incredibly. “I did three years at drama school and I had a long time at the National Youth Theatre. Then you find yourself doing jobs for a few days or maybe a bit longer when I had a part in Game Of Thrones. 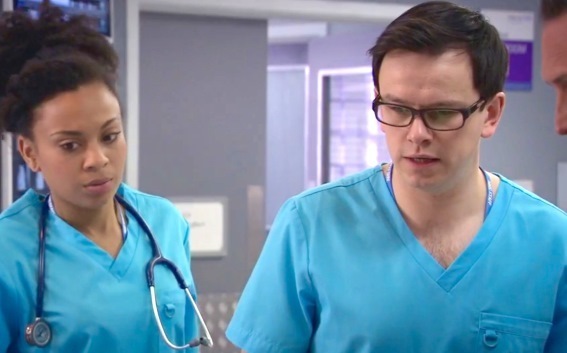 “So, when you have a long running part in something like Holby it’s brilliant. As well as the amazing acting experience you pick up, you get so close to the rest of the cast. And despite being shot in London Rob says there’s a real Scots heart to the show. “We’ve got Joe McFadden here as well as John Michie,” adds Rob, who lives with his sportswriter brother in the capital. Holby City is on Tuesdays, 10:35pm on BBC1 Scotland (8pm BBC1 elsewhere).